Normally today would be my rest day, but this weekend I have some exciting stuff happening and need my rest day to be Sunday. 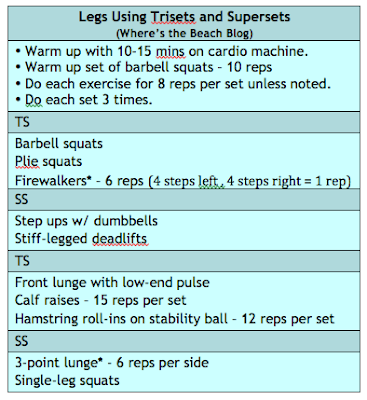 So, today I went with my leg workout that I had thought briefly about doing yesterday. ** 3-point lunge - Start with feet together and dumbbell held in both hands. Lunge forward, return to start; lunge side, return to start; lunge rear, return to start = 1 rep. Honestly, I didn't think this was going to be a good workout. My body is so used to rest days on Friday. I had to convince myself to get to the gym and just get moving. My legs were also sore from painting - up and down and up and down the ladder again does that to you. In the end, it was a really good workout surprisingly. I gotta say I love it when that happens. This weekend my pal Jessica from EatDrinkBreatheSweat is coming to visit along with her hubby! Jess and I started blogging one week a part and somehow found each other and connected instantly. We're long lost sisters or sisters from another life we're convinced. Jess and I got to meet at the 2010 Cathe Road Trip. We were supposed to get to visit again this past August, but things came up that prevented that (good things, but not good for a visit). Anyway, this trip has been a long time coming. I'm simply giddy with excitement! And you guys might get a special treat on Sunday. I'm thinking it's going to be an awesome weekend! Do you plan out your trips or do you try to just go with the flow - or a bit of both? Before I go, I can't forget to mentioned this. I recently receive a Liebster award from Marina at Cowboy Country Vegetarian. The rules are basically that I am supposed to copy/paste the award and link back plus pick my 5 fave bloggers with 200 or fewer followers. I think it's a great way to share the love and to learn about new blogs. So what I'd really love to do is have you guys share 1 new-to-you blog that you are loving.